This is my latest Wenger knife and it is also a bit special. It is a Classic 07 with yellow scales. The box is remarked. I believe the reason is that these are the last of the Wenger knives in the market in this country. There is a story behind these. The yellow handles are really nice. I have one from before that i changed the handles from red to yellow. It is a fresh and happy color. This is one is a bit more interesting and I got it for a very good price. 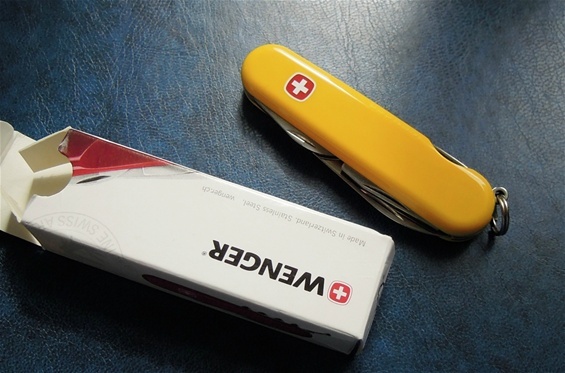 The Classic knives from Wenger are completely gone and the Classic range got the more traditional design that we identify with the main Swiss Army Knives. It is also a versatile design like the evolution is. The Classic or traditional design has been used for engraving, pad printing, inlays, decoration and many different colors in plastic. The shape or traditional handle has been made in a huge number of different materials in the Wenger history. The handle scales is not just a modern detail because if there is a knife company that pioneered new inventions and materials used on SAKs then we now Wenger is the one. 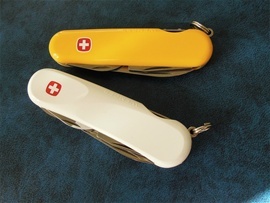 Here are the two knives together White evolution 16 and the Yellow Classic knife 07. Please take the time to look around Sakhome.com for information and knives. It took some time to build it and it gives much joy to me. Enjoy!